Stop the Hush, a group that uses creative activities to engage youths, was awarded $3,000 during a ceremony in Valparaiso on Monday hosted by United Way of Porter County's Power of Youth Council. The Power of Youth distributed a total of $9,000 in grants to four agencies in Porter County to support drug prevention efforts. 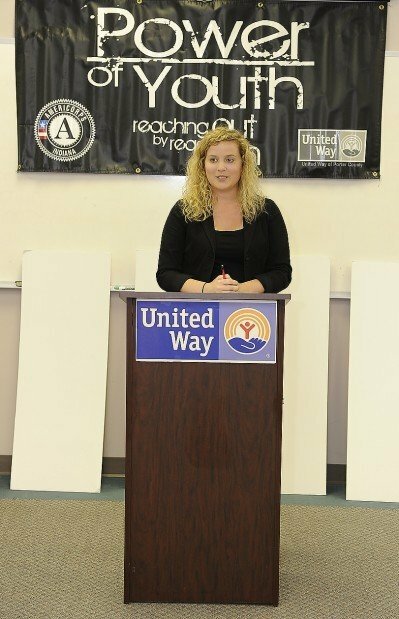 Liz Tesar, volunteer coordinator for United Way, speaks Monday during the United Way of Porter County's Power of Youth Council ceremony. The council distributed $9,000 in grants to strengthen drug prevention efforts. VALPARAISO | The United Way of Porter County donated $9,000 in grants this week to strengthen drug prevention programs. The United Way of Porter County's Power of Youth program distributed the grants to four agencies in Porter County at a ceremony Monday afternoon at the United Way offices in Valparaiso. The Boys & Girls Clubs of Porter County, Visiting Nurse Association and Discoveries Unlimited each received a $2,000 grant, while Stop the Hush received $3,000. The Boys & Girls Club's SMART Moves program helps youths resist substance abuse, while the VNA's Center for Grief and Healing helps children and teens deal with loss. "I am inspired by you," said Maria Galka, of the VNA. "Thank you so much for all your work." Discoveries Unlimited, a mentoring program for girls, also received a grant last year from Power of Youth. "Last year, we were able to double our capacity with the help of your grant," said Jeni McIntosh-Elkins, of Discoveries Unlimited. Stop the Hush prevents substance abuse by engaging students through creative activities such as open mike nights at cafes. "With this grant, we'll be able to start getting some really good events," said Rachael Cooper, vice president of Stop the Hush. Twenty Porter County high school students make up the Power of Youth Council, which hosts fundraisers, including Battle of the Bands and the Valpo 13.1 Race, during the year to fund the grants. While Power of Youth members engage in hands-on volunteer and fundraising experiences, members also learn about nonprofits and the process of grant development. "It's great for them to learn the grant allocation process so young," said Liz Tesar, volunteer coordinator for United Way. D.J. Dull, a freshman at Valparaiso High School, said he has noticed himself change as a result of participating in Power of Youth. "It's been a good thing to do," Dull said. "It's really strengthened my leadership skills." Tesar said Power of Youth already is looking to build its council for the coming year. "We have spots available at all nine high schools," Tesar said. She encourages interested teens to contact her at liz@unitedwaypc.org.